My friends, have I got a bona fide AMAZING recipe to share with you today. It's seriously one of the best things that I've cooked this entire year! I'm part of a really fun food blogger group called The Daring Kitchen. Our May 2012 Daring Cooks' hostess was Fabi of fabsfood. Fabi challenged us to make Boeuf Bourguignon, a classic French stew from the Burgundy region of France. Flavored with beef, red wine, herbs, and aromatic veggies...it's truly the ultimate comfort food! I’ve made Julia Child’s iconic version of beef bourguignon before. Once. I found all of the steps...and the dirty dishes...that it required quite exhausting. The dish was indeed worthy of the accolades that it’s received over the years, but I never made it again because of all the work that went into preparing it. My goal with this challenge was to come up with a streamlined version of bourguignon that didn’t skimp on the complex layers of flavor that this dish is known for. I'm happy to report that my No-Sweat Beef Bourguignon met this challenge with flying colors! By combining two recipes and tweaking them slightly for our tastes, I ended up with beef bourguignon that was full of complex, rich flavor using only my beloved Le Creuset Dutch oven...and eliminating a few of the extra steps! My starting point was a recipe that I found online via The New York Times. The recipe was from a French chef named Ginette Mathiot. She shared a streamlined method of making bourguignon that she says is typical of one that a French home cook would use. I also borrowed two ideas from Jacques Pepin: I used hangar steak for the meat...and added baby carrots to bypass the need for extra chopping. The initial prep work takes 30-45 minutes, then your oven does the rest of the work while you watch a movie, do laundry...or whatever around the house. It smells heavenly while it cooks, so you know you’re in for a treat when it’s ready to eat. Step 1: Preheat oven to 350. Heat 1 tbs. olive oil in a 5-quart Dutch oven over medium heat. Add 3 slices diced thick-cut bacon and one large shallot cut in half and into half moons. Sautee until the bacon is browned and the shallots are soft and golden. Remove using a slotted spoon and reserve, but leave the bacon fat in the pan. Cut 1.5 pounds hangar steak into bite-sized chunks...season with salt and pepper to taste and toss to coat with 2 tbs. flour in a bowl. Step 2: Add the floured beef cubes to the bottom of the Dutch oven, and brown them in the bacon fat. Add 1.5 cups beef stock, 2.5 cups good-quality red wine -- pinot noir is recommended. Stir well to deglaze the pan and get all those flavorful browned bits on the bottom. Add the reserved bacon and shallot, 2-3 sprigs fresh thyme, 2-3 bay leaves, and three roughly chopped garlic cloves. Bring to a boil, cover, and place in the oven. Bake covered for 1.5 hours. Step 3: After 1.5 hours, add 20 thin baby carrots and 6-7 cremini mushrooms that have been stemmed and quartered. Stir to combine the veggies into the pot, re-cover, and bake for another 45 minutes. When the bourguignon comes out of the oven, combine 1/2 cup red wine and 2 tbs. cornstarch in a measuring cup...whisk to make a slurry, and stir into the bourguignon to thicken it slightly. That’s it. Seriously, y’all...this bourguignon is pretty much the best thing you’ll ever eat! The beef is melt-in-your-mouth tender, and the sauce is really complex: beefy, with a distinct flavor from the wine. Make sure to use a wine that you’d drink...don’t cheap out, or you’ll regret it! I was lucky enough to find a $20 bottle of French wine on sale for only $9 at Central Market and grabbed it quick! After cooking, there was just enough wine left in the bottle to enjoy a glass. 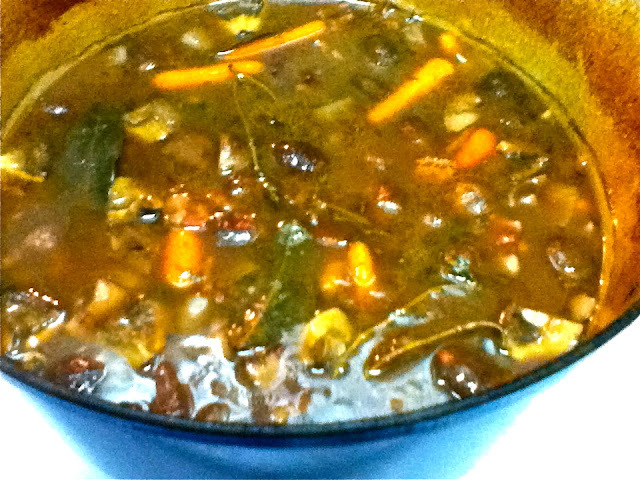 The bourguignon has a slight smoky flavor from the bacon...and the flavor of thyme is very subtle. I loved how shallots worked in this dish in place of pearl onions...and the combo of cremini mushroom and baby carrots gave the entire dish an earthy backbone. Beef bourguignon can be served over egg noodles or mashed potatoes...or you can do what I did: make some creamy cheese grits and place them in the bottom of each bowl before ladling the bourguignon on top. It was fantastic...the grits were creamy like mashed potatoes, but they were a bit more substantial and earthy. It partnered with the bourgignon perfectly. I brought the leftovers to work to share with my team, and they unanimously declared it “OMG delicious”! Best of all? Now that I have a streamlined way to prepare beef bourguignon, it’ll definitely be making many more appearances on my dinner table...especially during cooler months. Seriously...do yourself a favor. Make this dish as soon as you can. It’s like a little black dress: always classy, elegant, and appropriate! I didnt participate this month because I thought I just wouldn't have the time. WHERE WAS THIS RECIPE?? ?